Floor Area: 1,716 sq.ft. sq. ft. Since 1887, the historic Crane Resort in Barbados has been renowned for the stunning world-class Crane Beach, cool breezes, and the surrounding pristine, natural landscape of the island's South East coast. In more recent times, the resort has been at the forefront of luxury resort living, effortlessly combining unparalleled living spaces with an unmatched lifestyle. Now an exciting new Crane chapter is about to unfold with the introduction of a new luxurious, residential community - The Crane Private Residences. Uniquely positioned as a gated residential community within the gated Crane Resort, the master planned luxury development will consist of five residential buildings, each housing spacious (1,880 to 3,285 sq. ft.) two-bedroom and three-bedroom residences. 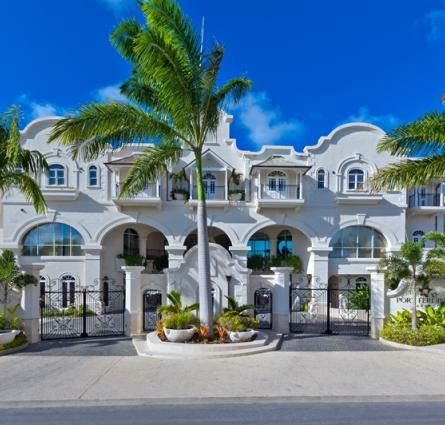 Spread over five acres, each building makes an impressive statement with clean architectural lines complementing the distinctly Barbados coral stone finish on the lower walls. Ground floor residences boast large private pools, while penthouse residences include private roof decks that command sweeping coastal views, dining gazebos and swimming pools. Ideal for long-term living, the private residences feature underground parking from which an elevator transports residents directly to the foyer within their residence. Bright and expansive, each residence features large kitchens complete with granite counter tops; spacious, private patios perfect for dining, lounging and entertaining as well as generously scaled natural stone bathrooms with large soaker tubs and glass showers. Residents wake up to a dream, as the grand master bedrooms face the same dramatic views as the living spaces, while the secondary bedrooms welcome in the lush tropical internal gardens. (Interior 1,716 sq.ft, Garage/Storage180 sq.ft., Patio/Pool 550 sq.ft., Total Sq.ft 2,446 Monthly Fee is US$1,397.00). (Interior 1,958 sq.ft, Garage/Storage 290 sq.ft., Patio/Pool 641 sq.ft., Total Sq.ft 2,889 Monthly Fee is US$1,618.00). (Interior 1,925 sq.ft, Garage/Storage 290 sq.ft., Total Sq.ft 2,215 Monthly Fee is US$1,463.00). (Interior 1,716 sq.ft, Garage/Storage180 sq.ft., Total Sq.ft 1,896 Monthly Fee is US$1,283.00). Note:	All prices are subject to change without notice. Monthly fee figures are estimates and are subject to change. Uniquely positioned as a gated residential community within the gated Crane Resort, the master planned luxury development will consist of five residential buildings, each housing spacious (1,880 to 3,285 sq. ft.) two-bedroom and three-bedroom residences.